Bonus! 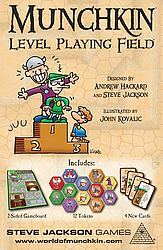 The Level Playing Field has a second side, with a 20-room dungeon layout for Epic Munchkin! One two-sided game board, 4 cards, and 12 tokens.